Exclusive 100% up to $500 bonus. Mac / Linux compatible instant-play. Exclusive 100% up to $500 welcome bonus. Soft competition in low to mid-limits. Live chat / telephone support. No cash for points in VIP club. No cash game action at Stud tables. Launched in 2004, Noble Poker’s partnership with the iPoker Network has resulted in Noble Poker being able to offer significant player traffic, and one of the most highly rated online poker software platforms in the industry. Relatively soft competition can be found at the cash game tables, while the extensive multi-table tournament schedule draws huge crowds with tough opposition as players near the final table. Sit and Go specialists can enjoy progressive jackpots, and Omaha lovers may compete in the Pot Limit Omaha tournament every Monday. A 100% welcome bonus of up to $500 is available to new players who make their first deposit using our exclusive Noble Poker bonus code. In addition, players can earn unlimited free cash for referring friends to Noble Poker, and rise through the levels of the Noble Club for access to VIP rolls and special online poker promotions. Utilizing the iPoker Network’s online poker software, created by the industry-leading developer, PlayTech, Noble Poker provides one of the most robust, feature-rich online gambling platforms available. Engineered with both new and veteran online poker players in mind, the navigation and table controls are user-friendly, and a plethora of customization options allow for greater optimization and personalization. 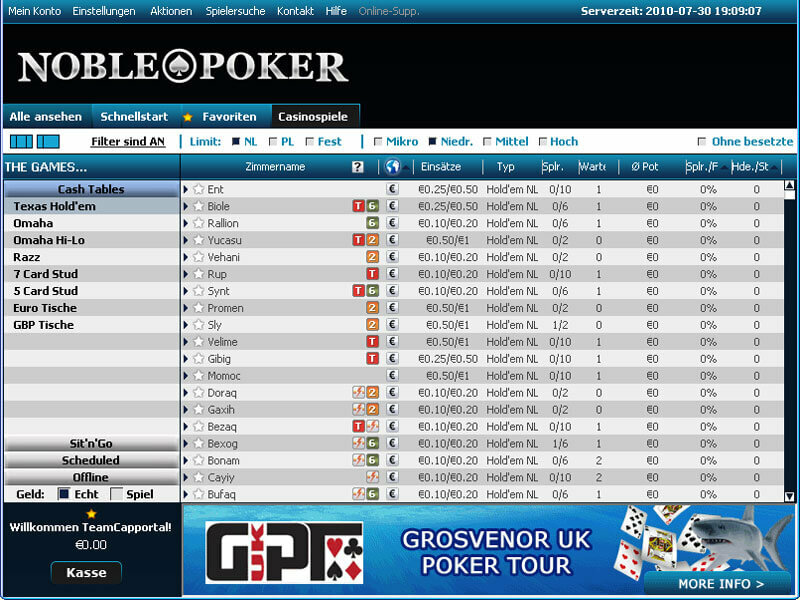 In addition to all of the standard functions players expect – such as hand histories, re-sizable tables and a buddy list to help players find their favorite opponents – the Noble Poker software also supports play at up to 16 tables simultaneously. With download versions available in English, French, German, Swedish, Russian, Italian, Spanish and Portuguese, the Noble Poker software is compatible with most modern Windows operating systems. 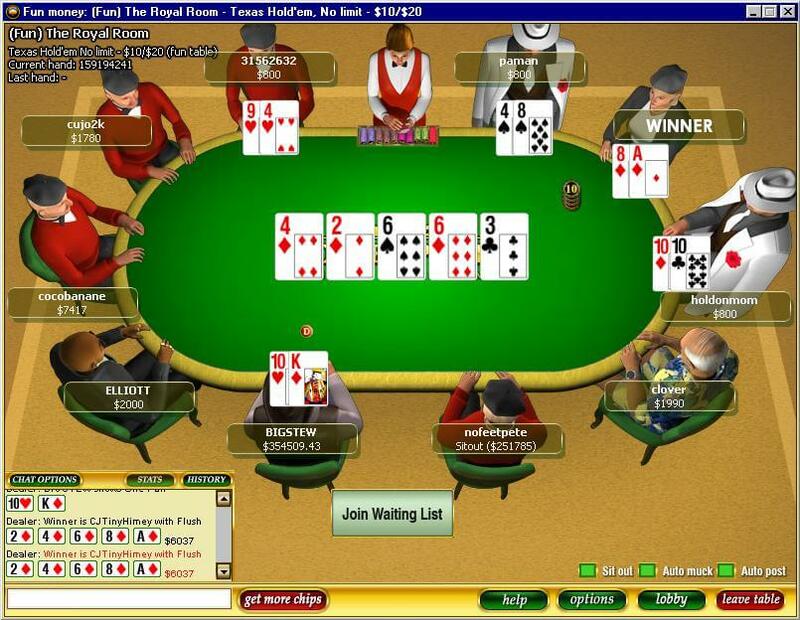 An instant-play Flash version is available on the Noble Poker website for Mac and Linux users, or those logging in from a remote computer. The iPoker Network is among the highest rated for online poker traffic, allowing Noble Poker to share in a massive player pool. Cash games in all of the most popular poker forms in the EU are impressively active in both peak and off-peak hours. Additionally, the Noble Poker tournament schedule draws a tremendous turn-out, resulting in large cash prizes. Online poker tournament specialists will have no trouble finding a wide range of tournaments at Noble Poker, to fit any bankroll size. From weekly guaranteed tournaments to daily progressive jackpot Sit and Gos, Noble Poker’s tournament schedule delivers competitions of every size and value. One of the most popular tournaments on the iPoker Network is the $200K Guaranteed every Sunday, with satellites to the tournament running throughout the week. On Fridays, players can compete for a slice of the $60,000 guaranteed prize, then take a shot at the $20,000 Double Stack Freezeout. Omaha lovers can join in the action at the Monday Night Pot Limit Omaha tournament with an $8,500 guaranteed prize. Online poker players at Noble Poker are supplied with all of the most popular poker forms. Texas Hold’em is available in No Limit, Fixed Limit and Pot Limit, though action at the pot limit Hold’em cash games is rare to find. Omaha and Omaha Hi-Lo are provided as well, with the Pot Limit structure drawing the bulk of the Omaha traffic. 7 Card Stud is an option at Noble Poker, but the cash game tables are usually empty. Sharing a player base with the entire iPoker Network, the competition at the lower stakes cash games is generally pretty soft. As one moves up to the mid-limit games, some of the opposition is a bit tougher. A little knowledge about table selection will be tremendously helpful to finding the juiciest games. Noble Poker is usually a fish tank. Many of the players come straight from casinos and are introduced to the world of online poker. Additionally, there’s a bunch of casino games available directly through the poker software. As with most other rooms, you will find soft competition in No Limit games, preferably at mid stakes but sometimes even at high stakes. The EveryPoker.com staff knows of many stories about players who have gone all-in with $1000+ pots with absolutely nothing on their hand. First-time depositors at Noble Poker may take advantage of our exclusive 100% Noble Poker bonus offer of up to $500. To claim this rewarding online poker bonus, enter our Noble Poker coupon code – – while making your initial deposit. The Noble Poker sign up bonus is released to participating players in increments of $10 per 1000 points earned playing raked cash games and online poker tournaments with entry fees. Players are granted 3 months to fulfill the terms of the Noble Poker welcome bonus. The Noble Club rewards frequent players for their continued patronage with a 6-tiered incentive program that pays off relative to the player’s activity level. From the 2nd Crown Level and up, (1000+ points per month) players are invited to enter Noble Poker’s VIP rolls. Players who achieve the 5th and 6th tiers are privileged to exclusive promotional offers from Noble Poker. In addition to a myriad of online tournament options, Noble Poker also presents players with an opportunity to attend major live events, such as the World Series of Poker. With prize packages for both main and side events, players can qualify through a series of low buy-in satellites, or buy-in directly into the final tournament. Another interesting promotion at Noble Poker is the Partners Program, which is much like a refer-a-friend bonus, without a cap on how much one can earn for each referral. The Noble Poker Partners Program pays players who refer new players to Noble Poker 25% of the rake generated by each referred player. Partners Program earnings are deposited into the player’s account every month, and may be immediately withdrawn (ie. there are no bonus conditions to fulfill). 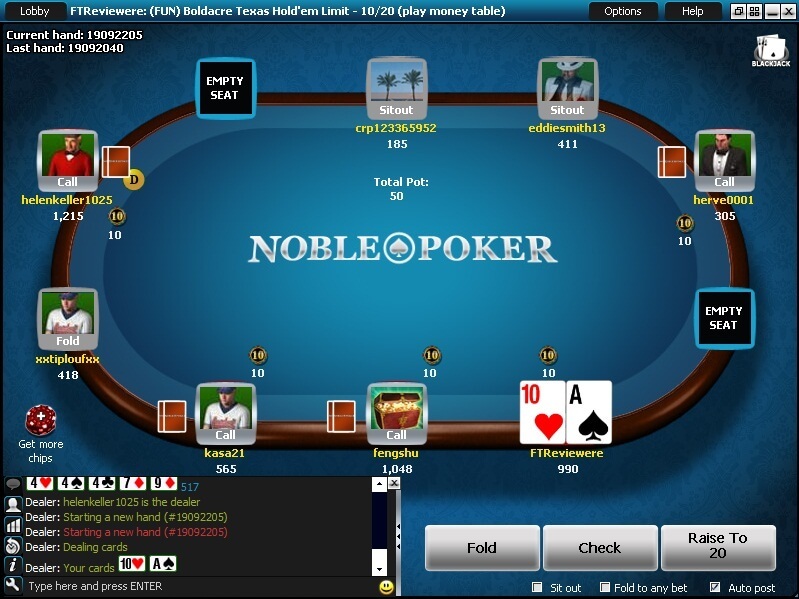 Noble Poker offers several convenient methods for contacting the Noble Poker support team. A live chat feature allows players to receive immediate help with whatever issues may come up. Support may also be reached by an international toll free telephone number, or by email. Deposits: Visa, MasterCard, Visa Electron, Delta, Maestro, Solo, EntroPay, Postepay, CartaSi, Qiwi, Paysafecard, Ukash, Ticket Premium, Moneybookers, NETeller, Click2Pay, Click and Buy, myCitadel, WebMoney, UseMyBank, iDeal, Instadebit, Sofort, Giropay, EPS, Gluepay, eWire, Euteller, Nordea, DK, MisterCash, POLi, Laser, Multibanco, Boleto Bancario, Moneta.ru, Przelewy24, Abaqoos, eKonto and direct bank transfer. Cashouts: NETeller, Moneybookers, WebMoney, bank draft and check.